From today till Friday, the training program is devoted to surgery in the theatre of the ORBIS plane and the Eye Theatre in Sarawak General Hospital. 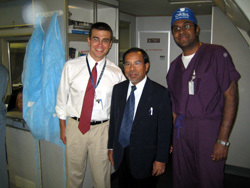 Lectures are given in between life surgery. 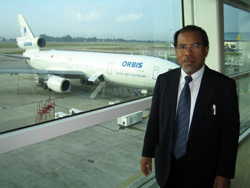 Prof Dr. Mohd Azib Salleh, Deputy Vice Chancellor of UNIMAS, visiting ORBIS. 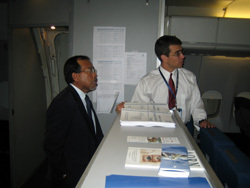 Dr. Hunter showed the interior of ORBIS plane to Prof Dr. Mohd Azib Salleh. 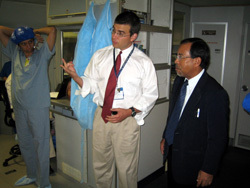 Prof Dr. Mohd Azib Salleh being shown the operating theatre. Explaining the steps during live small incision cataract surgery. Capsulorrhexis during small incision cataract surgery. Interactive live small incision cataract surgery. Scene in the ORBIS theatre. Long waiting can make you wanting to meditate. Medical officers from Sarawak General Hospital during ORBIS coffee break. Nice change from long clinic.